The famous Bowen Mango also known as Kensington Pride (or Strawberry, or Apple!) is the most common variety grown due to its excellent quality edible fruit. Trees may begin to bear fruit at three years of age, harvest season is around February. Mango trees make handsome landscape specimens and shade trees. They are erect and fast growing with sufficient heat, and the canopy can be broad and rounded, or more upright, with a relatively slender crown. It is ultimately a large tree (can be to 20m but is usually half that size) though it responds well to being kept small through regular pruning. The tree is long-lived with some specimens known to be over 300 years old and still fruiting. In deep soil the taproot descends to a depth of 20 ft, and the profuse, wide-spreading feeder roots also send down many anchor roots which penetrate for several feet. Full sun. Mangoes must be protected from winter cold, i.e. frosts and chill winds until they are about three years old or about 2.5m high. They will thrive in a very wide range of soil types from sand to heavy clay soils. Organic fertilizers are best, since the trees are subject to fertilizer burn. Young trees are particularly sensitive to over-fertilizing, but respond well to seaweed solution. 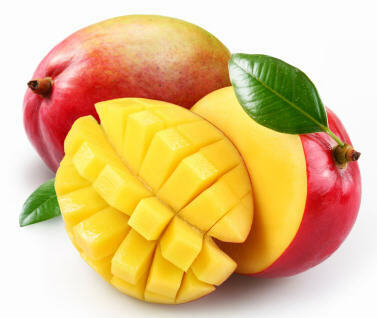 Mangos may be pruned to control size in late winter (after the last frost) or early spring without a loss of fruit. Note: sap and debris can cause severe dermatitis. Birds! Cover with a net, hang old CD's from the tree, or encourage the birds to eat just a few by collecting the half eaten fruit and attaching to the tree - they will usually eat ones they have already broken the skin on.